Exodus 1 "Every son that is born to the Hebrews you shall cast into the Nile"
Exodus 2:1-22 "She named him Moses, for she said 'Because I drew him out of the water.'" Exodus 2:23-3:20 "God heard their groaning, and remembered his covenant"
Exodus 5:1-6:1 "But Pharoah said, 'Who is the Lord, that I should heed his voice and let Israel go?'" Exodus 6:2-13 "I will redeem you with an outstretched arm, and I will take you for my people"
Exodus 6:28-7:24 "Moses struck the water that was in the Nile, and all the water turned to blood"
Exodus 10:21-11:10 "Stretch out your hand that there may be darkness over the land of Egypt, a darkness to be felt"
Exodus 12:1-20 "It is the Lord's Passover. 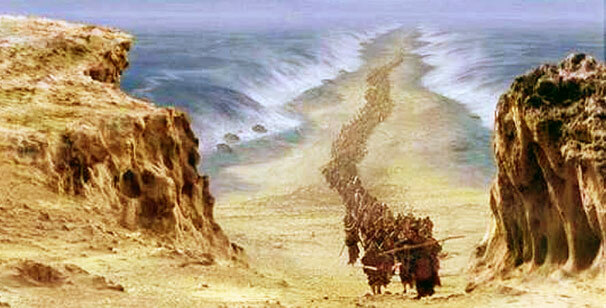 For I will pass over you, and no plague shall fall upon you to destroy you, when I smite the land of Egypt." Exodus 12:21-36 "It is the sacrifice of the Lord's Passover"
Exodus 12:37-51 "It was a night of watching by the Lord, to bring them out of the land of Egypt"
Exodus 13:17-49 "The Lord went before them by day in a pillar of cloud and by night in a pillar of fire to give them light"
Exodus 14:10-31 "Fear not, stand firm, and see the salvation of the Lord, which he will work for you today"
Exodus 16:1-18,35 "I will rain bread from heaven for you"
Exodus 17:1-16 "They put the Lord to the proof by saying, 'Is the Lord among us or not?'" Exodus 18:13-27 "Choose able men, such as fear God, men who are trustworthy and who hate a bribe"
Exodus 19:1-25; 20:18-20 "If you will obey my voice and keep my covenant, you shall be my own possession"
Exodus 20:1-17 "God spoke all these words"
Exodus 22:20-23:9 "You shall not follow a multitude to do evil"
Exodus 24:1-18 "All the words which the Lord has spoken we will do"
Exodus 32:1-20 "I have seen this people and behold, it is a stiff-necked people"
Exodus 33:7-11; 33:18-34:9; 34:29-35 "The Lord used to speak to Moses face to face, as a man speaks to his friend"
Exodus 34:10-28 "You shall worship no other god, for the Lord, whose name is Jealous, is a jealous God"
Exodus 35:4-19; 35:30-36:1; 37:1-9 "He filled him with the Spirit of God, with ability, intelligence, knowledge, and with all craftsmanship"
Exodus 40:16-38 "The glory of the Lord filled the tabernacle"
Leviticus 8:1-29; 9:22-24 "Assemble all the congregation at the door of the tent of meeting"
Leviticus 16:2-28 "Thus he shall make atonement because of their transgressions, all their sins"
Leviticus 19:1-4, 11-18 "You shall be holy; for I the Lord your God am holy"
Numbers 11:4-30 "Would that all the Lord's people were prophets, that the Lord would put his spirit upon them!" Numbers 12:16-13:33 "We seemed to ourselves like grasshoppers, and so we seemed to them"
Numbers 14:1-25 "The Lord is with us; do not fear them"
Numbers 20:1-13, 21:4-9 "Make a fiery serpent, and set it on a pole; and every one who is bitten, when he sees it, shall live"
Redeemer: Understanding the Meaning of the Life, Death, and Resurrection of Jesus Christ, by Stephen B. Clark, (c) 1992, published by Tabor House, Lansing, Michigan, USA.